Kenzie Ellis prepares to throw the ball. The freshman pitcher was roughed up in Sunday’s opening game, allowing 8 runs in 4 innings of work. Once Northwestern finally got a lead, it finally won a game. After trailing start-to-finish in the first two games of the series, the Wildcats (11-20, 2-4 Big Ten) took a first inning lead in the second game of Sunday’s doubleheader and never looked back en route to a 10-2, five-inning win in a series loss to No. 21 Minnesota (24-10, 5-1). NU scored early and often, plating three runs in each of the first three innings. Senior shortstop Andrea Filler and freshman third baseman Morgan Nelson both homered, and five Cats had two RBIs each. 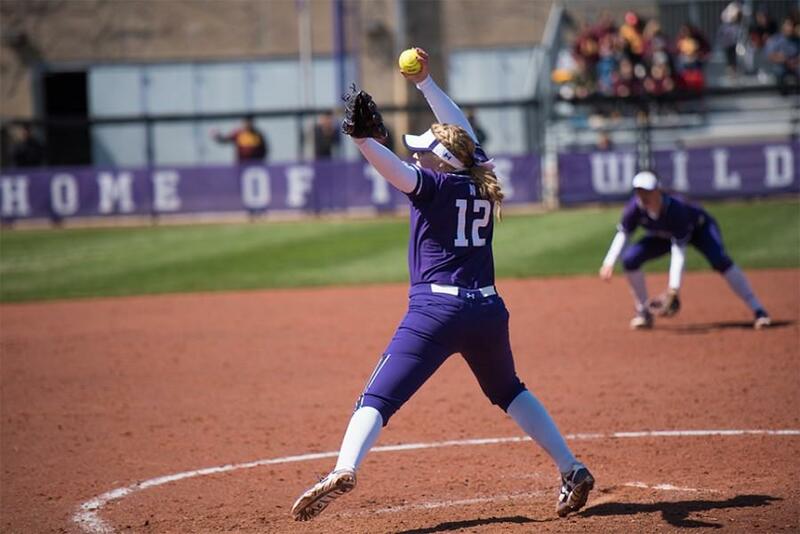 NU roughed up Minnesota starter Nikki Anderson, who allowed 5 earned runs in just 1.1 innings. Starting pitcher Amy Letourneau also helped reverse NU’s fortunes. The senior, who has not pitched for more than a week after being hit by a pitch against Michigan, threw a complete game in the Cats’ win. Letourneau’s pitching came in sharp contrast to NU’s pitching performances earlier in the series. Without Letourneau and fellow senior Kristen Wood — out with an undisclosed injury — the Cats relied heavily on freshman Kenzie Ellis. Ellis gave up 11 earned runs in 3 innings Friday and then was tagged for 8 runs in 4 innings in Sunday’s first game, which had been moved from Saturday due to inclement weather. Ellis and others were far outshined in the circle by Minnesota’s Sara Groenewegen. The 2015 second-team All-American allowed just 2 hits in 4 innings pitched in Friday’s 16-0 Gophers win; she gave up 3 earned runs in 5.2 innings in Minnesota’s 8-4 win in Sunday’s first game. Nelson was among the few Cats to find success against Groenewegen, slamming a 3-run homer over the centerfield fence in Sunday’s first game in addition to her 2-run shot in the series finale. The freshman entered the series hitting just .212. NU had a handful of opportunities to score in its two losses but, for the most part, failed to take advantage of them. The Cats had two runners on with no outs in both the first and fourth innings of Friday’s game but came away with nothing. In the second game of the series, NU had runners in scoring position in both the sixth and seventh innings but, like on Friday, could not score. The Gophers, meanwhile, took full advantage of their opportunities. Minnesota knocked 7 home runs in the series, 5 of which came with runners on base. The series concluded a difficult opening stretch to Big Ten play for the Cats, who played No. 2 Michigan last weekend to begin the conference schedule. That came after a challenging non-conference slate in which NU played a handful of ranked teams, including three in the top 10. Letourneau said such a difficult schedule prepared the Cats well for a rebound in the series finale.